Hey Long Island! We’re bringing the party to you! So get tickets and join us Friday night, May 31st for an FUV 80s Dance Party! Join WFUV DJs Darren DeVivo, Eric Holland and Russ Borris as they take you back to the best of the 80s – as only WFUV can do. Rock, Disco, Punk and more.. The music, the bands, the hair! 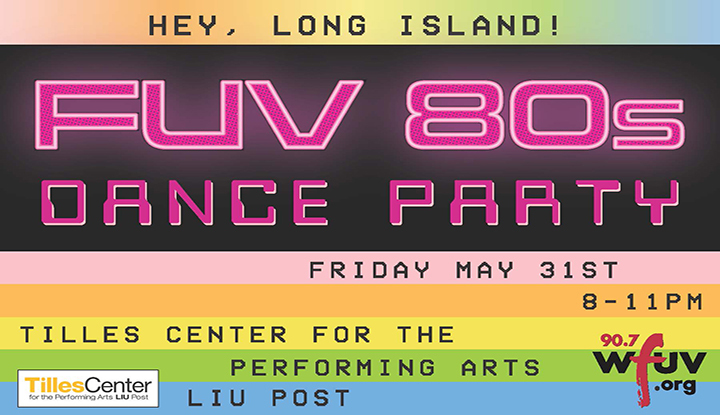 Bring your friends and your best dance moves… WFUV is giving the 80s some FUV LUV for a night of fun at Tilles Center!